Nothing says “I’m on vacation” more than being by a body of water; a staycation should be no different. If you have a pool in your backyard, get it cleaned and take full advantage of it. Bust out your favorite bikini and a big straw hat. If you don’t have a pool or access to a friend’s, spend the day at the beach instead. Swimming is great exercise and salt water can act like a cleanser, especially if you have acne-prone skin. 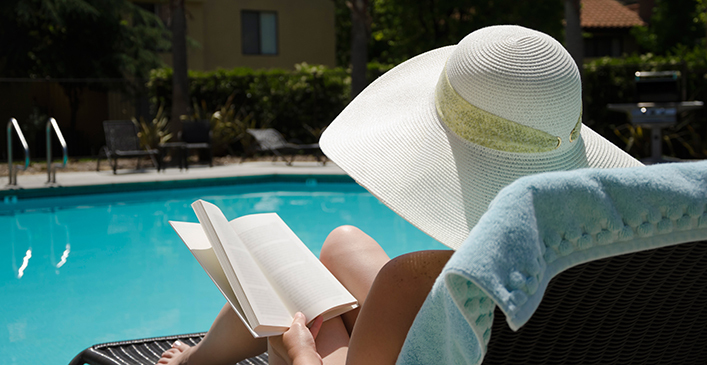 For added relaxation, bring a good book and lay out for a tan. All your work friends will be jealous.